FHI: Why is FHI needed? It is unfortunate that there are still negative attitudes and social taboos against the disabled in many parts of this world. 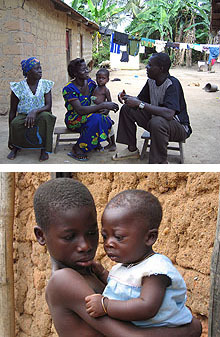 It is a big issue in Ghana, throughout Africa and other developing countries to give birth to a physically handicapped child. Some say it is a curse from the gods. Some parents with backward beliefs still bury alive their disabled children's God-given potential gifts by wilfully or ignorantly not bothering to send them to school. To some of these parents, their children's deafness, blindness, crippling or mental illness is a hopeless situation that cannot be helped. To others it is a waste of resources, educating or training a disabled child. There are other parents who do value their disabled children - but are truly poor and cannot meet the expenses of their disabled children's education. Whatever the case, these children with disabilities are being discriminated against. They are deprived and neglected for conditions that are not their making. Thousands of these struggle in this darkness without any hope. But the most amazing thing is that God loves them - and so do we! FHI is imitating the love and compassion of Jesus Christ by reaching out to these deprived, neglected and needy handicapped children. Through education, training and general welfare we can help them make life meaningful and fulfilling - and have confidence in themselves to integrate well into society.